One for all. Love. Marriage. Baby Carriage. Life moves fast. However, first-time expectant parents are about to experience new shifts in speed. Grocery runs become a crawl. Dirty diapers are reason to sprint. While second (and third) time parents have more realistic expectations, the VISTA keeps them all moving forward, no matter what life throws their way. 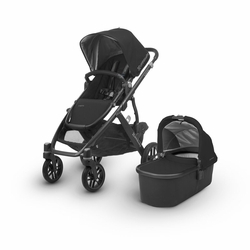 The VISTA's intuitive design allows for multiple configurations, making transporting a second and third child a breeze - all while strolling like a single. Suitable from 3 mo. to 50 lbs.